Donald Trump supporters and anti-Trump demonstrators clash outside a campaign event for in San Diego on Friday. 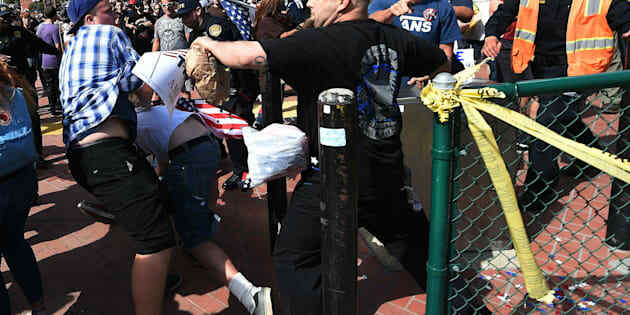 A Donald Trump rally in San Diego resulted in clashes Friday night between anti-Trump protesters, Trump supporters and police, leading to dozens of arrests. Thousands of people converged at the San Diego Convention Center, where the presumptive Republican presidential nominee was speaking. As Trump supporters left the venue around 5 p.m., protesters confronted them. A man is arrested during a demonstration against presumptive GOP nominee Donald Trump outside his campaign event in San Diego on Friday. Police with batons drawn moved to separate the two sides and hold a barrier, which protesters breached. After some people threw bottles and began fighting, police declared the gathering an unlawful assembly and ordered everyone to disperse. It then became a misdemeanor to remain in the area, and police had cleared it by about an hour later. Officials said 18 people had "received medical attention at the area," according to the San Diego Union-Tribune. The San Diego Police Department reported 35 arrests. The SDPD did not immediately respond to a request for comment. Police hit some protesters with little balls containing pepper spray, according to reports. Police have not yet confirmed they used the chemical irritant. Trump weighed in on the clashes and police response on Twitter. Trump’s proposal to build a wall to keep out immigrants carries additional significance in San Diego, an increasingly bicultural city on the U.S.-Mexico border. Many protesters brandished Mexican flags, condemning Trump’s positions on immigration and race. Trump supporters and protesters have clashed regularly, and often violently, during his presidential campaign stops -- most recently in Albuquerque, New Mexico, where police threw smoke grenades at protesters. Trump’s San Diego rally was one of several campaign stops in California ahead of the state’s June 7 primary. This article has been updated to reflect the number of arrests announced by police.